A fortunate byproduct of our quest to live on southern islands and forever walk the beach this winter has been the close proximity of so many beautiful historical sites, especially old forts and lighthouses. We spent January on Dauphin Island, Alabama, within walking distance of Fort Gaines, and five miles from Fort Morgan just across Mobile Bay. In February we were on Anastasia Island near the archaic Castillo de San Marcos at St. Augustine, Florida. Heading from Florida to North Carolina we stopped for a week at Savannah, Georgia where we visited Fort Pulaski on Cockspur Island in the Savannah River. 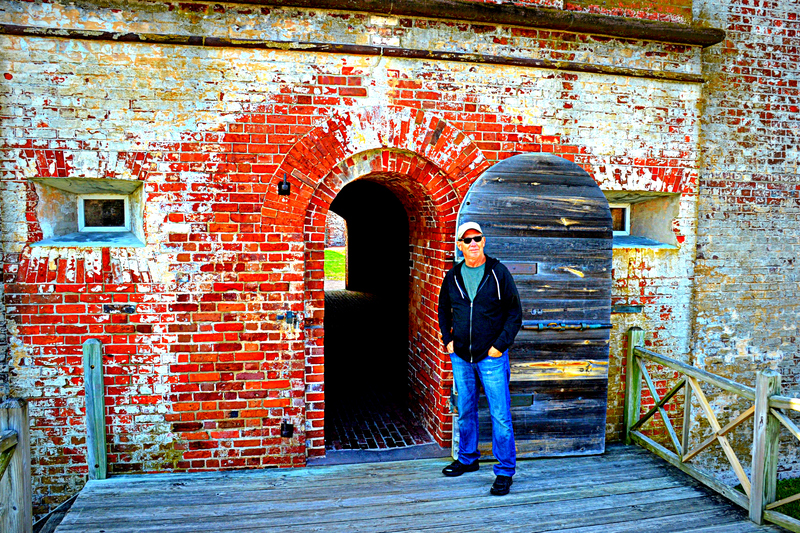 And in March we are on Emerald Isle, North Carolina, sharing the island with Fort Macon which we visited yesterday. 1. 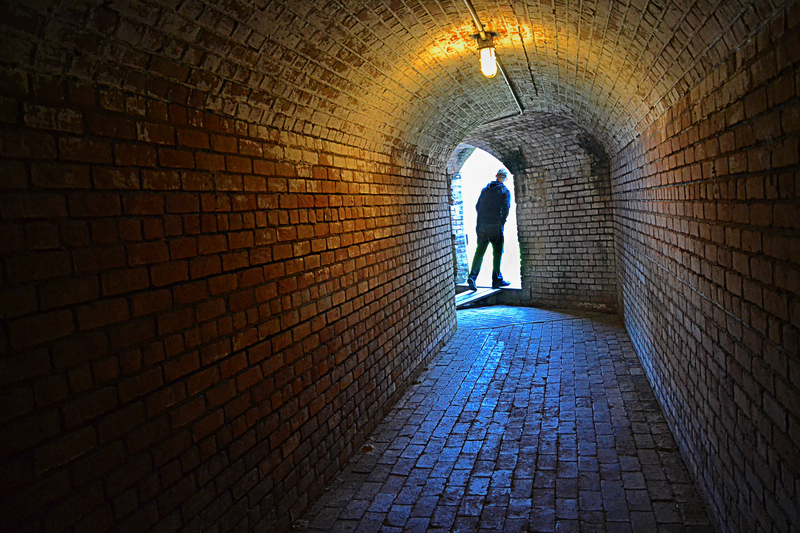 Fort Gaines, Dauphin Island, Alabama. This fort was less than 1/4 mile from our campground. 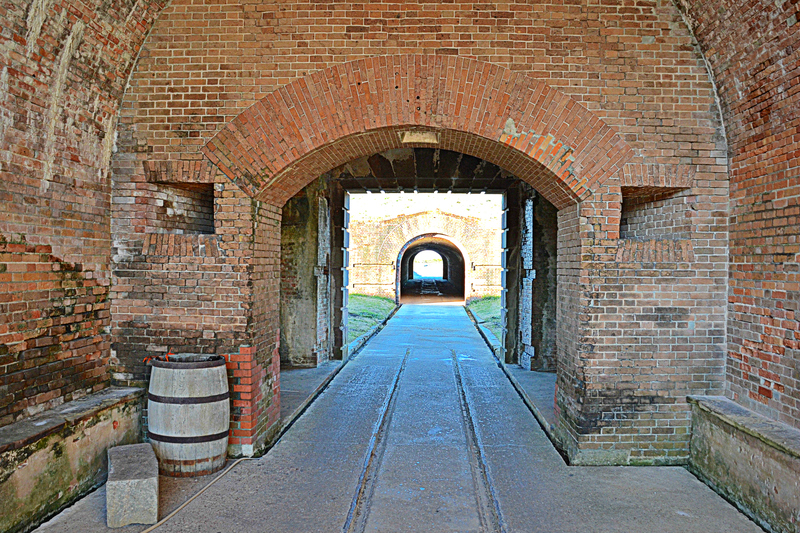 Fort Gaines has long tunnels leading to the five corner bastions. Cool. The bricklayers who built these forts were masters of their craft as seen in the intricately vaulted arches of the northeast bastion. 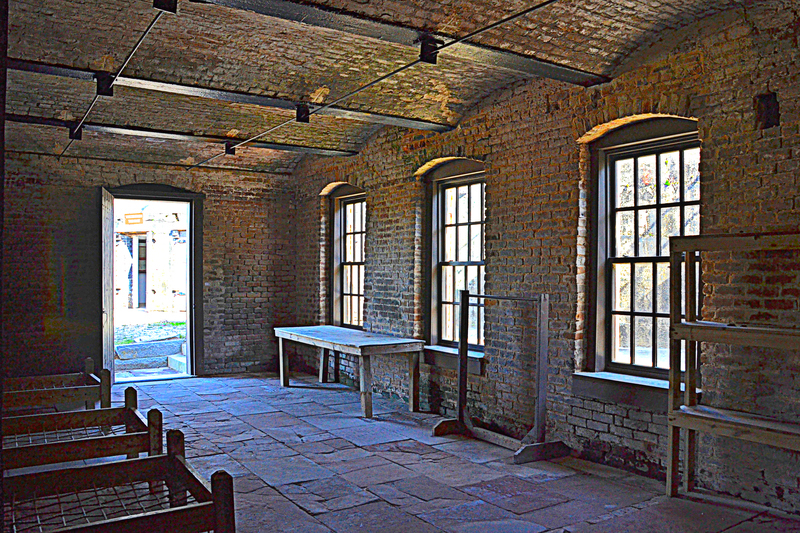 Though the interior buildings were burned during the Battle of Mobile Bay, the preservationists have done a great job of restoring and maintaining what was left..
Here’s a gem I discovered hidden deep inside a chamber at the end of a long tunnel along the 4-foot thick outside wall, a 10-seat latrine. 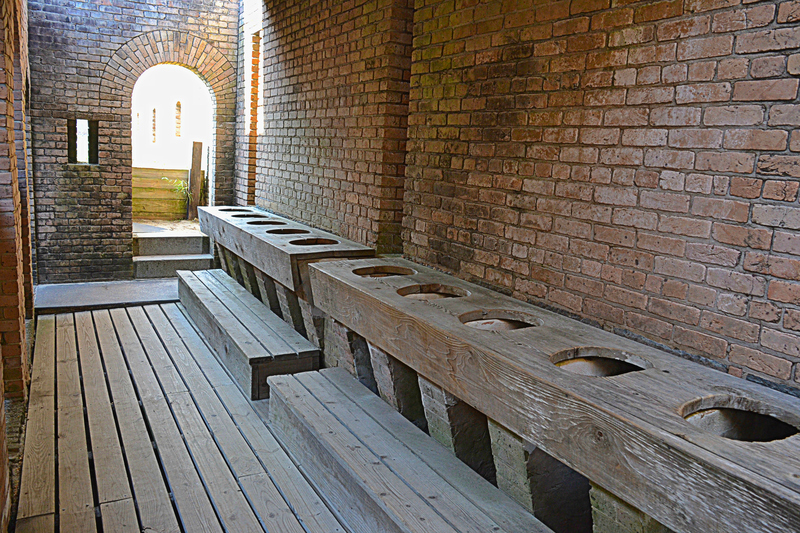 Soldiers apparently didn’t have much privacy. 2. Fort Morgan, Mobile Bay, Alabama. 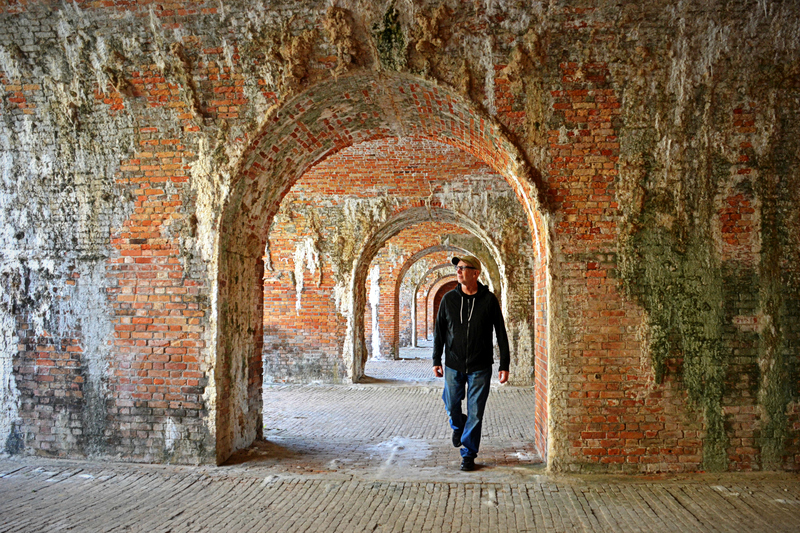 I loved the endless vaulted casemates of Fort Morgan and the mineral deposits built up by the chemical action of rainwater percolating through the brick and mortar. 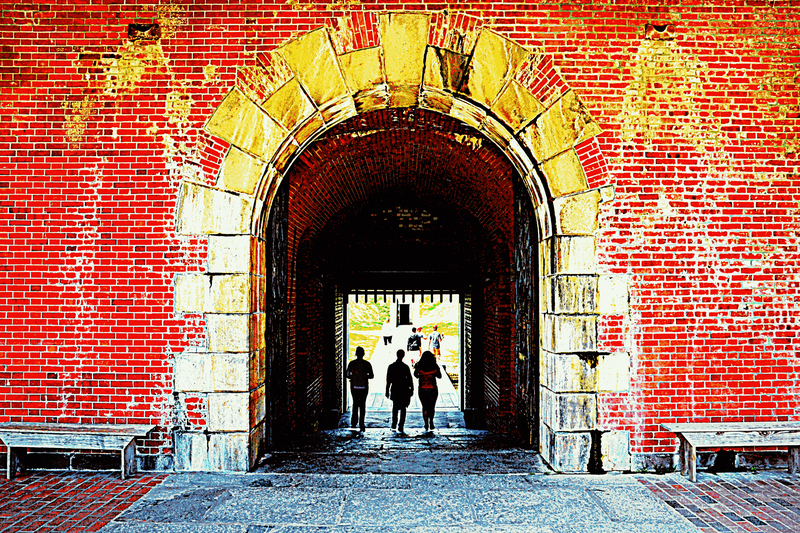 Fort Morgan is a fort within a fort. This view is from the tunnel through the postern (outer fort) viewing the entrance of the inner fort. And this rear view is from the entrance tunnel in the inner fort toward the postern (outer fort). 3. 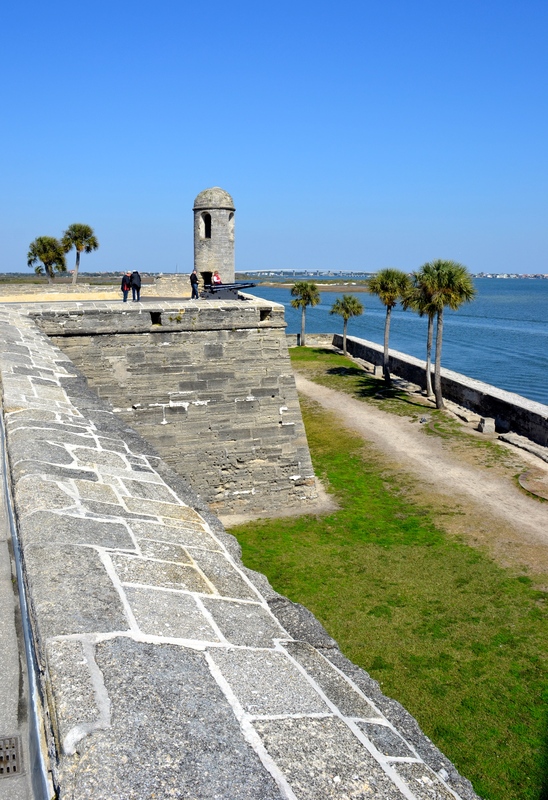 Castillo de San Marco, St. Augustine, Florida (1565). 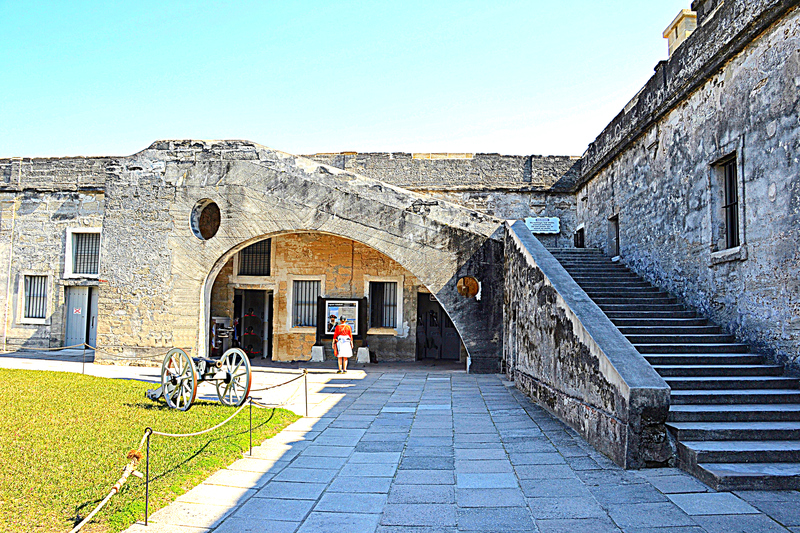 This one is really old and was built with local stone – coquina – before bricks were manufactured in the U.S.
Castillo de San Marcos sits on the waterfront at downtown St. Augustine.. 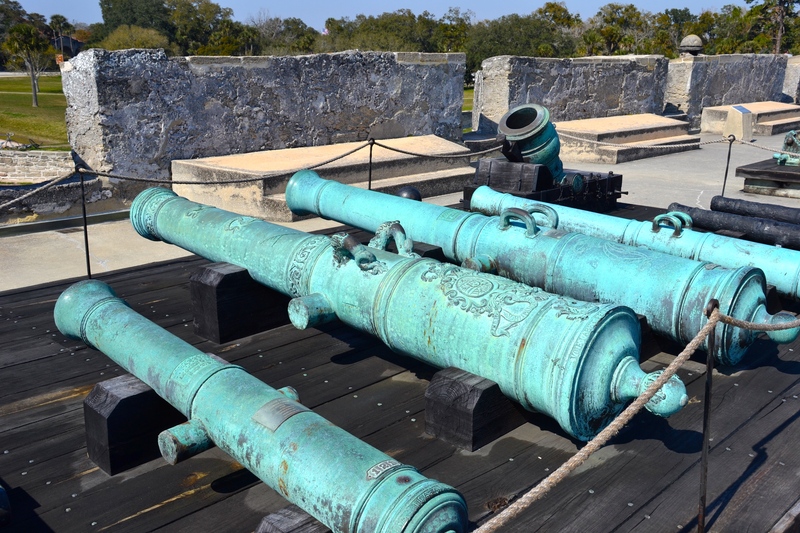 This fort had a great collection of cannons, some of the oldest ones I have seen. 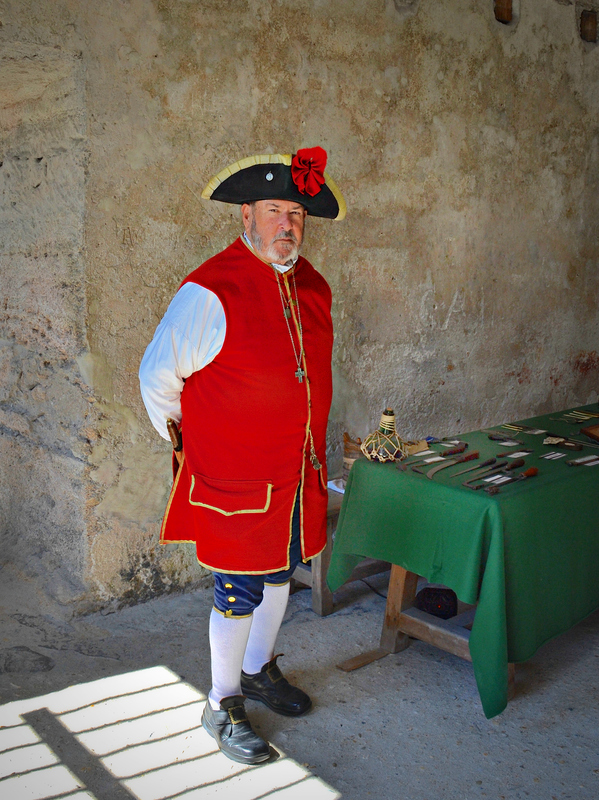 Although most of the forts have seasonal re-enactments, this one has costumed historians on hand every day. 4. 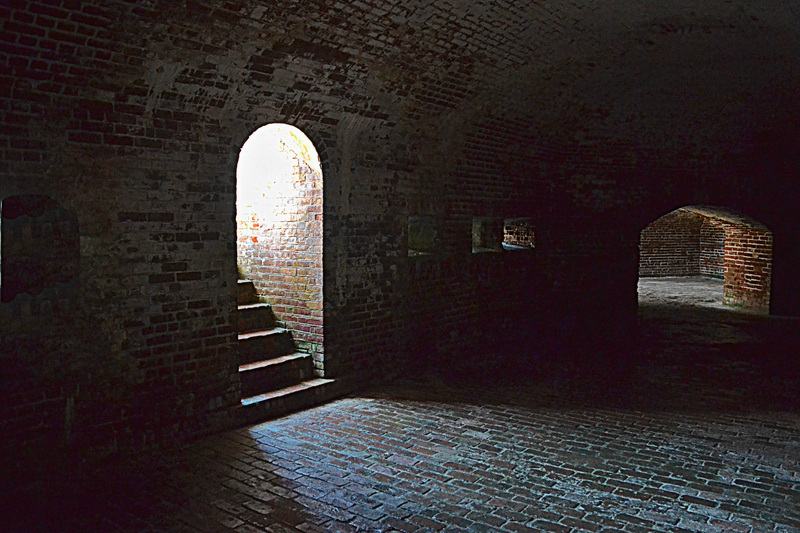 Fort Pulaski, Cockspur Island, Savannah, Georgia. 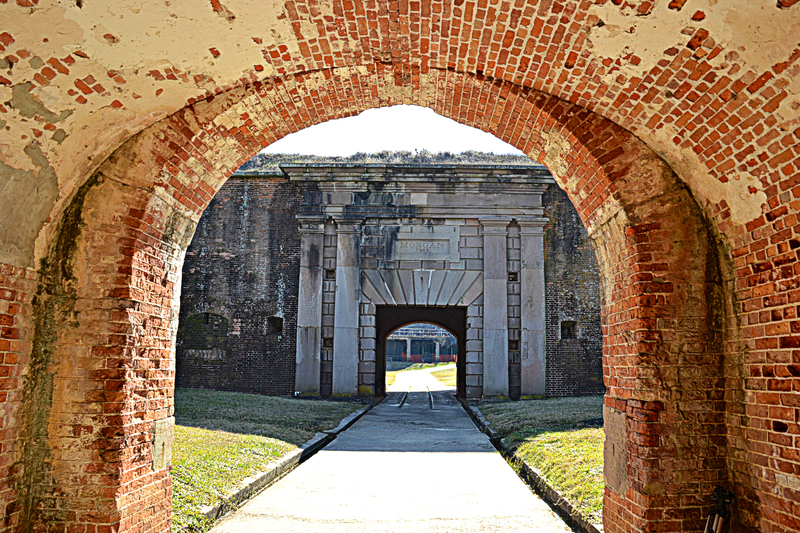 Though the impervious nature of fort design leaves them looking nondescript and unwelcoming on the outside, this fort had an attractive inside archway. 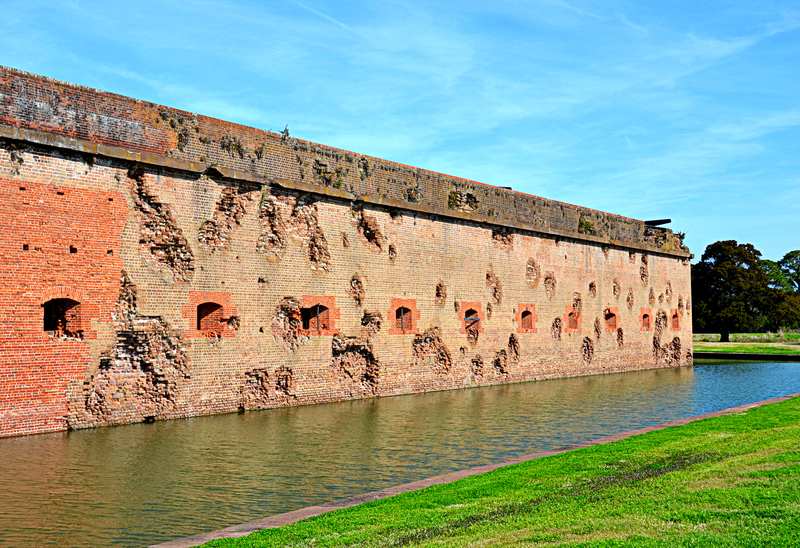 While many forts are restored to their pre-war condition, this one was still covered with the scars of war. Only the corner that had been breached by the Union Army’s rifled cannons during the Civil War was restored to its original condition. 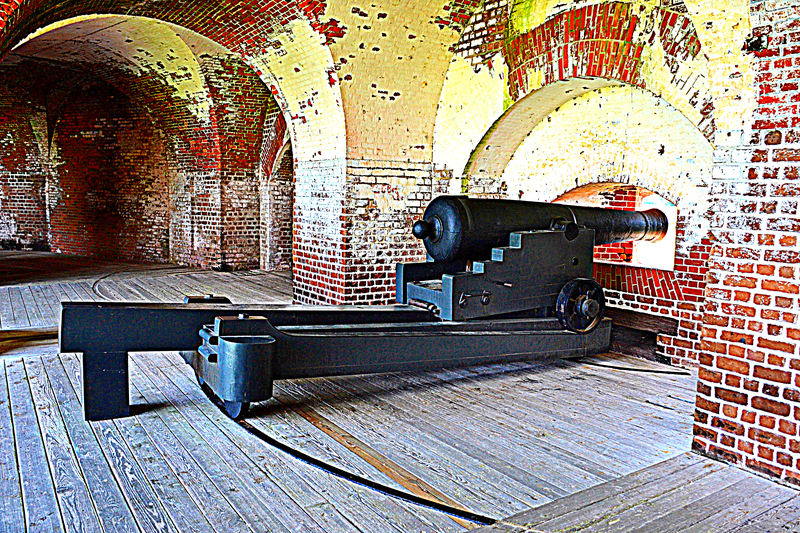 Fort Pulaski had several cannons installed at their original stations. 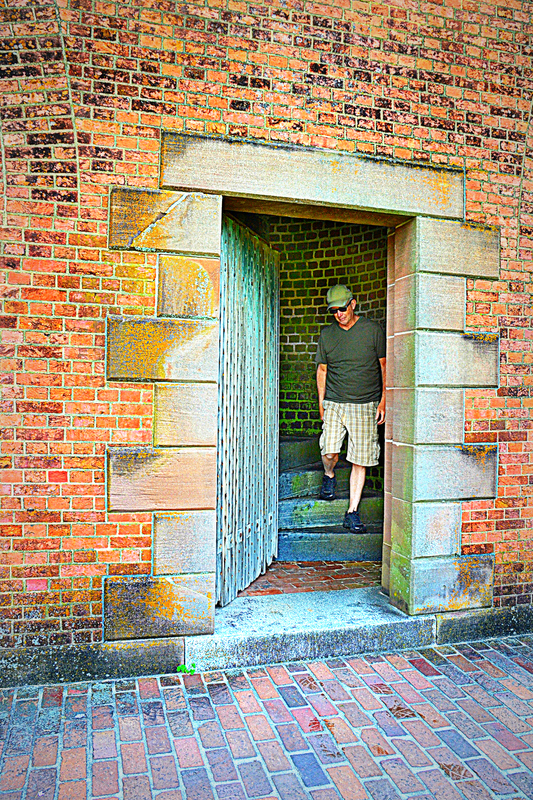 There were five stairways, one in each of the five corners of the fort. Three of them were circular stairs. …and the other two had their own unique designs. 5. 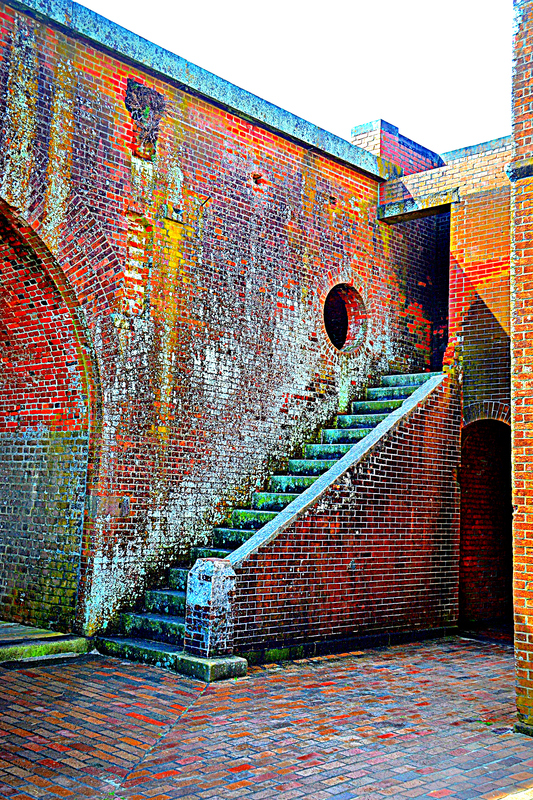 Fort Macon, Emerald Isle, North Carolina. 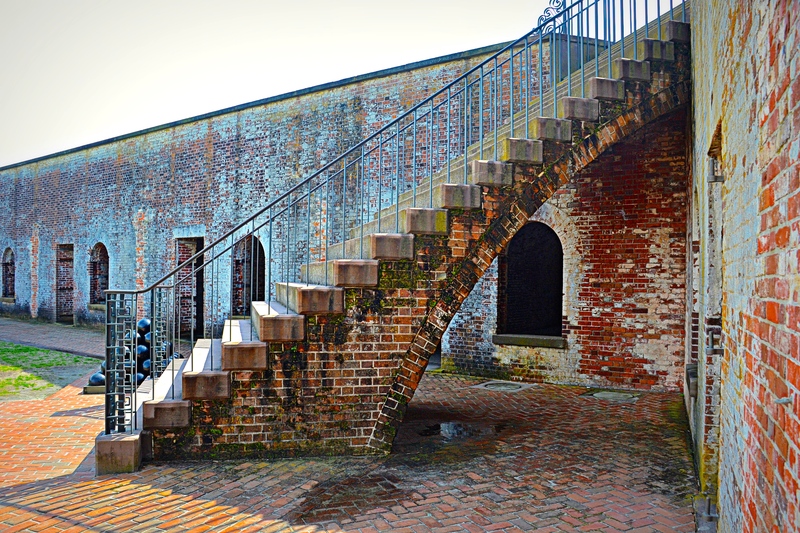 My favorite feature at Fort Macon was the three identical stairways built over graceful arches. The smaller rear entrance was as interesting and beautiful as the front. 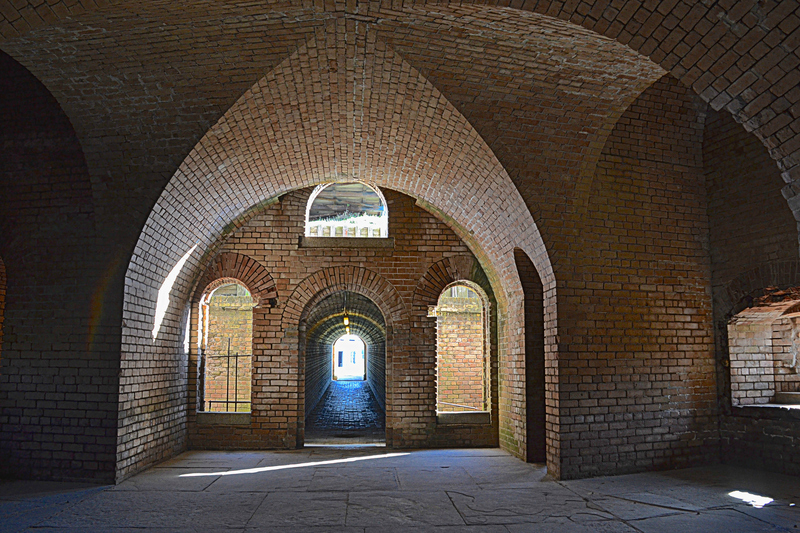 The arches and hidden stairways create interesting scenes as the light plays around them. 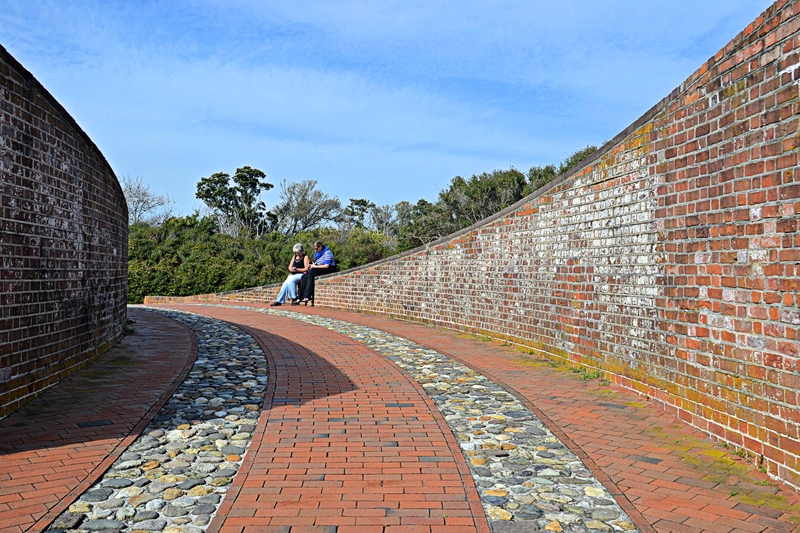 The approach to Fort Macon is a study in graceful curves. Kaye and I have really enjoyed our southern sojourn and the side trips that have been available to us. I love old architecture, so this was a great place for me to explore while avoiding the hostility of the northern winter. This is the final post to the Southern Sojourn as we are heading back to our new summer home (campground) in Michigan soon. There are more photos of these beautiful historical sites on my Flickr photo stream here. And they are available for purchase as prints and other great gifts at my photo galleries and web store here. “One of the cool things about all of our wandering is that we get to meet interesting people along the way. People with fascinating stories. Everybody has a story, you know – about where they live, where they used to live, about where they’ve traveled, what they’ve experienced. About their jobs and hobbies and accomplishments. Maybe about things they are good at or things they love.